1. friends & family. of course! what would i do without them?? my family is weird and quirky and we tease each other a lot. and my friends are just awesome. my closest friends (childhood, high school, and college) are so fun to be around. all we do is talk. talk, talk, talk. it's one of my favorite things to do. 2. people-watching. i swear i'm not creepy, but people-watching is just so much fun. especially when people don't realize they're being watched and they're doing something weird (i've seen you dancing/singing/picking your nose in the car! hehe). 3. arts & crafts. i've dabbled in lots of different mediums (from finger paint to origami) and am currently in love with my sewing machine and my glue gun. i have crafter's ADD or something and am always working on a new project. i always have so many ideas going on in my head, but few ever actually get executed. i also tend to abandon some projects when i'm halfway done with them. it's a terrible habit, but i get bored so quickly (which is why i'm always experimenting and looking for something new to do). 4. food. oh god. i'm such a foodie. i just love baking cupcakes (other than baking, i'm a bit inept in the kitchen) and watching the food network. especially "diners, drive-ins & dives" (guy has the best job ever, i swear. i mean, i wish i could get paid to drive around in a cute red convertible and eat junky, fried, delicious food all day! of course, i'd probably gain about 70 pounds or so, but at least i'd have my dream job). 5. fashion. it's one of the best (and probably the most fun) ways to express yourself. plus, i'm a shopaholic. if i'm not shopping, i'm window shopping. or looking at pictures of street fashion online. i'm just fascinated by all the combinations and styles and silhuoettes and everything. just everything. i love it. 6. music. i'm constantly looking for new bands to listen to and have everything from oldies and standards to pop and indie rock in my ipod. except for country. and rap. not too interested in those genres, but my tastes are pretty diverse. details: white t-shirt (screenprinted men's hanes plain white v-neck. we had this t-shirt project in my screenprinting class and my friend ashley gave this to me in exchange for one of the ones i printed. i really like her lace design! 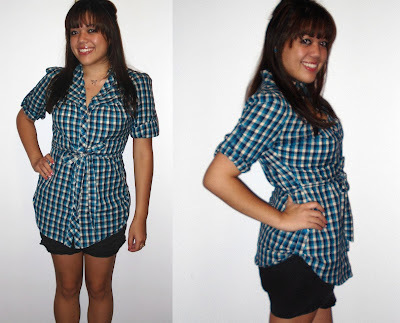 ), gray plaid shorts (new york & co.), black wide elastic belt (f21), brown flip-flops (old navy). and a small update for my etsy shop. i made one of those awesome convertible dresses in a sweet raspberry cotton/rayon knit. ahhh i wanted to keep it for myself, but i really shouldn't. besides, i made one for myself just last week. i'll be making more once i buy more fabric (i desperately need new materials; i'm running out!). gosh i'm so excited for halloween. i have tons of ideas for costumes and have been sketching things out and ordering materials. i can't wait to get some new things ready for my shop!